Bright red Ferraris are the flame to the car enthusiast's inner moth. They attract an insane amount of attention and are striking from nearly any angle, but what if I told you that you can buy a screaming Ferrari of your very own, for no more than the price of your average used hum-drum family sedan? 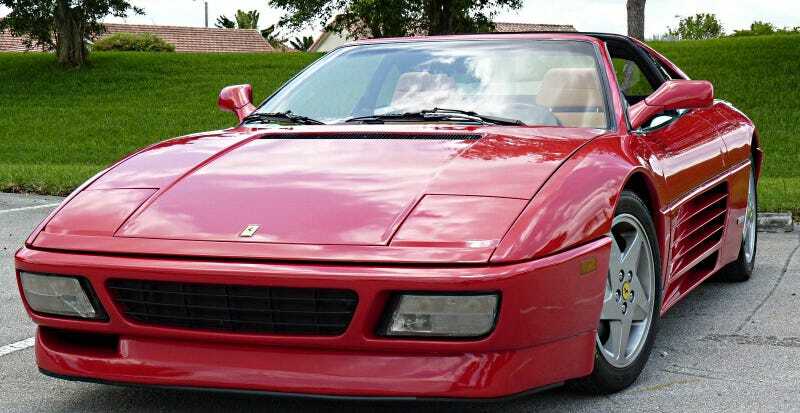 This 1991 Ferrari 348 TS is the rarest of Ferraris - it's one that has actually been driven. So much, in fact, that its nearly 80,000 miles have rendered it unwanted by the regular Ferrari aficionados, who are too busy cleaning their cars with cloth diapers to actually drive their powerful machines. With its 3.4 liter V8 and 5-speed manual, it's all the Ferrari you'll need, biding your time until your company goes public, of course. This eye candy can be yours. I've really enjoyed driving it, now it can be yours. It has high mileage, that's why it has the low price, but it is a driver Ferrari, not a garage queen. All the service records are included, car fax is also done, just took it to the mechanic to get it ready for the next owner. Questions call now 954-684 8872 and ask for Alex. I'm not a mechanic but can give you his number in case you need technical details. I have all the paperwork. Only interested people please. The car is a 91 so there is minor wear and tear under close inspection. Fog lamps show small cracks but are functional." At this price, even if it did need some reconditioning and the periodical engine-out procedure, it would still be less than nearly every other 348 on the market today, and it would have a clean title, with a full service history. +1, would hoon.